This publication, produced to the requirements of the Royal Air Force, presents in tabular and graphical form astronomical data required for the planning of activities, in particular aircraft movements, where the amount of daylight, the duration of twilight, and the position and phase of the Moon are important. It replaces The Air Almanac which last appeared in 1997. This annual volume contains data for the times of rising and setting of the Sun and Moon, as well as the twilight times for latitudes between North 72° and South 60°. Graphical methods for determining this information at altitudes of up to 60,000 feet and at high latitudes are also provided, as are standard times for many places around the world. The 2015, 2016, 2017, 2018 and 2019 editions are available as a free download. The 2020 edition will be available in December 2019. Please note this electronic publication has been designed as a book with a front and back cover and is suitable for viewing in two-page mode. When using Adobe Acrobat, 'Book View' can be set by checking the 'Show Cover Page During Two-Up' in page display. 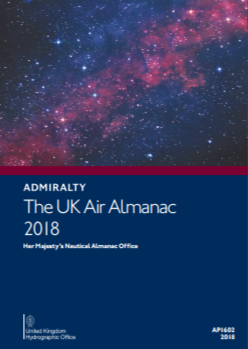 The 2015, 2016, 2017, 2018 and 2019 editions of the UK Air Almanac can be downloaded from here.